Today I went together with my flatmate to the school at which I will start to study on Monday. It was a large apartment building, given its location and statue it most probably has a brilliant view over the Bosphorus and Marmara Sea. The door was open so we went in to the reception where I greeted the two women working there. I told them my name and explained that I have come from Sweden to study the language, all in Turkish of course. They looked puzzled and said, but you already know Turkish! I smiled and said yes, but obviously not enough. They had apparently assigned me in a level 1 class, which we both agreed would be far too easy. Instead of this they told me that I was to take a test on Monday, enabling them to understand my level of knowledge and subsequently putting me in a class where I can develop. Good news indeed. After this my flatmate went on to the gym, leaving me with an empty stomach and the urge for adventure! I made the 5 minute walk passed our place and went on down Istiklal Caddesi (the main commercial boulevard on the European side of Istanbul). During my walk I thought to myself, what will I eat? Having a limited, if any, knowledge at all of the city restaurants and simultaneously not being able to hear my thoughts due to my shouting stomach, I played with the idea of eating at Burger King. No, that is simply to lame, I declared and came up with another idea. I went in to the Turkcell (phone operator) store and talked to my new acquaintance Yusuf. Yusuf was the first guy to help me with my SIM card and since I felt he was nice and service minded I immediately decided that I would always go to him when needing a refill of credits. Maybe he gets a percentage of the business my refills generate? Anyhow, it is pretty close to home and he seemed helpful. He pointed across the street and promised good meal. When I asked him what the prices were he scratched his beard stubble and looked at me as if he hesitated. After that he said ”Tamam”, meaning Ok in Turkish, and gave me the directions to a restaurant located on a small backstreet, and said that he just came from there a couple of minutes ago. We chitchatted for a minute before I went off to find the place. Arriving at the restaurant, named Balkan Lokanta (Balkan restaurant), I immediately realized I had found gold. It was the typical Turkish indiginous diner with all kinds of soups, rice, lamb, chicken, dolma, beans, cacık (tsatsiki) and of course no even half of a tourist as far as I could see. I ordered kurufasülye (beans and tomato sauce), two large pieces of fresh bread, coban salatasi (tomatoes, peppers and onions), ice tea and a bottle of water. The bill was 6 Turkish liras which multiplied by 5 turns into 30 crones and approximately 3 euros. In other words, extremely cheap! However, I was so hungry that I ate it all up in an elitist pace, rendering myself unmovable for 30 minutes. Sitting there I felt like a child, relearning a lesson for the 999th time. I did not enjoy the meal, but the acquired knowledge of a cheap and tasteful restaurant near by softened my stomach pain and eventually allowed me to go home and rest. Until next time! Naturally I forgot to attach the pictures from todays exploring. Here they are! I sit down on the balcony of my new home and gaze upon the view of this powerful city I now am a part of. The sound of frightened barking dogs who never knew domestication, the constant echo of ringing police sirens shouting in unfamiliar tones, literally thousands of buildings right next to, and even on top of each other. The tight proximity of these structures reminds me of a failed game of Tetris, yet it is far from a failure. They just remain still. Circulating on top of this immense view are hundreds of flapping seagulls seemingly looking for something. My guess would be food. The sound of traffic is distinguishable and every once in a while the loud sound of an engine, probably a truck, has me guessing if it is not actually driving through the living room. A man is shouting something in Turkish through a megaphone, I can not make out the words but I can tell he is passionate about his message. Boats in all sizes, ferries, trawlers, sight-seeing boats and even smaller ones keep going back and forth from Europe to Asia and straight out into the Marmara Sea. Today I managed to get my SIM card running, meaning I can now be reached on a Turkish phone number, 0090 536 524 8605. 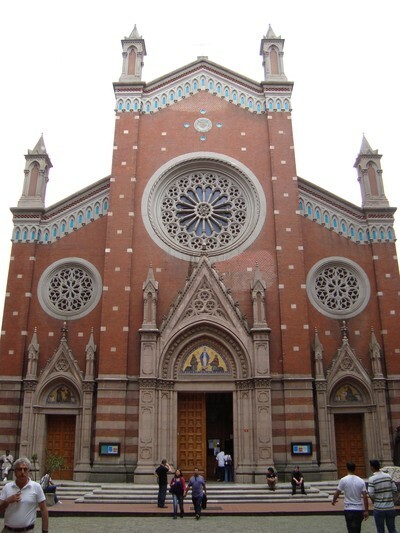 I walked down Itiklal Caddesi and talked to a salesman in one of the Turkcell stores. He helped me and told me he worked 12 hours a day making 400 dollars a month. I was not going to say anything but as he prompted to ask me what his Swedish equivalences are making I replied around 1400 Euros a month. He laughed, told his colleague and shook his head. He was helpful so I promised to go back there every time I need a refill. I went on making a pretty huge cash withdrawal in order to pay the landlord, this made me nervous at first but i managed to blend in to the crowd and kept on walking down Istiklal Caddesi. On my way I decided to walk down the entire boulevard and did so until it got split into two smaller roads. On my way back two things caught my eye. 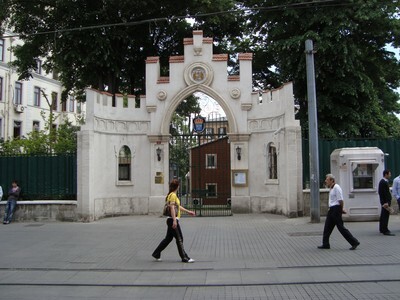 The first was the Swedish consulate, a large enclosed area with the characteristic three crones symbol marked the spot. The second took more investigation. From the street perspective I just noticed that there was a gate and above it the virgin Mary sat in her traditional pose, innocent eyes and a tilted head. I went in and was amazed by the large church that could be found inside. It was the St. Antonio di Padova church, originally an Italian church built 1725 but later on demolished and replace with the current building. The latter was built in the beginning of the 20th century. I approached it with caution and respect, a posture I always try to keep when visiting place of worship, regardless of what religion it might belong to. From the look of the people going in and out I could quickly tell that it was open for the public. The signs in Turkish prohibiting food, taking pictures, talking or even praying while walking (?!) also indicated that it was an open church. To my disappointment people did not seem to respect this when entering it. I saw flashes, heard a constant mumble while some actually tried to pray. Regardlessly it was a pleasant experience. When I went out on the yard I realized that I did not know the name of the church. I looked around and saw an old woman sitting down by a pillar, holding prayer beeds and wearing a peculiar head covering. I decided to ask her, and I did it in Turkish. - ”Yes indeed I do. It’s the Catholic church of St.Antonio Padova. Where are you from?” the woman replied with newly found enthusiasm and looked upon me kindly. - ”Sweden.” I said, smiling at her. Her face lit up with joy and I could see that we shared that moment in a peaceful understanding. After telling me that she loved all the prophets I politely thanked her, wished her a good day and went back to Cihangir. After eating a sandwich at home I felt exhausted and surrendered to a couple of hours of sleep. After waking up I remembered doing so when being in Alanya (SE Turkey) as well. Is it the heat? I do not know but now I feel better than ever, ready to go out and pick up a döner kebab. Until next time! It is 03.44 in the morning. My bottom level panorama view over the train station in Eskilstuna is getting brighter and brighter every minute that passes. As if falling asleep was not difficult enough already, I think to myself and turn in my bed yet another time. I had my friends over tonight, enjoying each others company a last time before my trip begins. It was a blast, I must say. They are a multi flavored bunch of individuals with good hearts and intentions. I will surely miss them. The past days have mainly consisted of practical things like cleaning the apartment, packing and making other arrangements necessary for Daniel, the guy who will be staying at my place the next coming 6 months. A combination of several 1 1/2 hour night walks with my good friend Sia and sloppy clothing has invited a sore throat accompanied by a runny nose. Feeling warm and tired at times I have smiled at the ironi and asked myself if this what travel fever really feels like. Two friends have offered to hook me up with open minded people in Istanbul and for that I am grateful. Adventure is still the objective, but knowledgeable and helpful people is always welcome. Especially when moving to a new country! I will be landing in Turkey around 16 or 17 o' clock, depending on adjustment to Turkish time. If we optimistically add another hour to that for claiming the baggage and maneuvering the cart to the airbuses I think it is safe to say I will be in Taksim the earliest at 20 o´ clock Turkish time. Most probably this means that my first night in Turkey will be spent calmly somewhere on a restaurant where I can enjoy the phenomenal kitchen typical for the region, and try getting a good night of sleep. On Tuesday I am told there is a Turkish holiday. The 19th of May is celebrated as the Commemoration of Atatürk, Youth and Sports Day. In Turkish it is Atatürk'ü Anma or Gençlik ve Spor Bayramı. The origin of this holiday can logically be traced to the date of May 19, 1919, when the Turkish War of Independence was started which subsequently lead to the creation of the Republic Of Turkey. How does Istanbul smell, taste and feel on a holiday like this? I will find out and let you know! As the title discretely implies this post will be in the spirit of declaring my intentions with the 6 month long visit to Istanbul. For the past few months I have heard more variations of this question than I can remember. - "Oh you are going to Turkey? That's cool. Why?" - "Well I am going to study the language." To be honest my answer has often been short in a polite dismissing kind of way, ”Because I am part Turkish”. That is simply because in most situations there was no time to go in to details. At least not enough time for me to give what I feel would be the best and sufficient answer representing my thoughts and feelings on this trip. In other words, it is complicated. I grew up in a middle class home with a Turkish mother and a Swedish father. Since my dad could not speak Turkish and had no ambitions to learn it, my mother chose to speak Swedish exclusively rather than making us (me and my older brother) bilingual. In effect this meant that throughout my childhood I could not communicate thoroughly with many of my relatives, not to mention my grandmother and grandfather. I can still remember how it was to hear mom and grandma speak Turkish without understanding a word. Many times I asked mom why they were fighting and she replied that they were not and told me that Turkish was simply spoken louder than the soft careful Swedish I knew. This really bothered me, I felt left out and socially handicapped when trying to speak to relatives. So Turkey was a strange country for me? In a way it was, in a way it was not. My mother and father bought an apartment in the tourist city of Alanya, located in southwestern Turkey, when they got married. We spent many summers there sunbathing in the ocean, enjoying the magnificent food and building up energy in order to once again go back and work another year. I have many pleasant memories from those summers but regardlessly they did not shape me in the constructive way an actual visit to our relatives, 100 miles away in the ”real” Turkey, would have done. It might sound like I am blaming my parents or holding them in contempt but it is quite the opposite, I love them for everything they have done for me. I am merely trying to make you understand the background of this huge change in my life I have decided to make. What sometimes puzzles me is that while my mother chose not to teach us Turkish, she insisted on sending us to the mosque where we learned how to read Arabic (without understanding it), the history of the abrahamitic religions and also how to pray according to Islam. This period really shaped me. Sure, I believe in God and have my word with him every once in a while, but I am not a religious guy at all. Growing up a Muslim half Turkish Swedish guy in a Swedish neighborhood who could not speak Turkish, the language of those sharing the same faith as him, contributed to a feeling of ”out of place” constantly being present through out my childhood. Who was i? Combining this hollow equation with the regular identity crisis anyone suffers in their teens I REALLY did not know who I was. The question of who I was made me interested in both the culture and language and at 13 I finally decided that I would try and learn it as much as I could. I started to constantly ask questions on grammar, vocabulary and pronunciation. I started hanging out with kids my age who had a ethnic or linguistic ties to Turkey. Slowly but surely my Turkish got better and I used to dream of moving there after I finished school. When the time came for graduation I drifted without anything to do for a couple of months until I got lucky and found work within IT. I spent four years in that business working at three different companies, learning how practical adult life could be. Naturally I moved out and got my own place, earned my liberties and became a regular ”9-5er”. This is what put my dream on hold and kept it shackled but it could only do so for so long. The experience of four years out there working is without equivalence and I do not regret anything. However, the question remains – who am i? I think Istanbul knows the answer and she is dying to tell me. All I have to do is go, and I will. 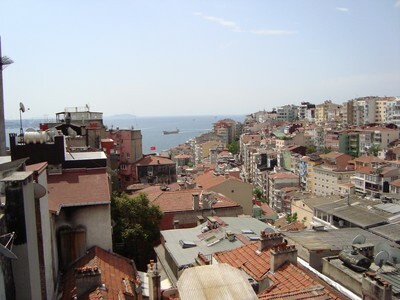 At this hour in 12 days I will be driving from the airport to Taksim to settle in my new home. 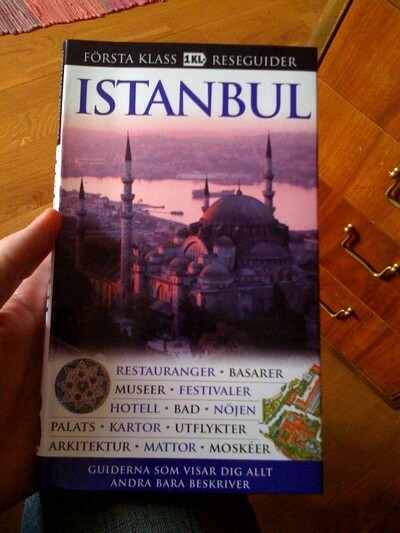 At my last day at the office my colleagues gave me a thank you gift - a "first class travelers guide to Istanbul". They could not have come up with a better gift. Since my first week will be without school I can spend it exploring the city of which it is said Napoleon spoke with great admiration.